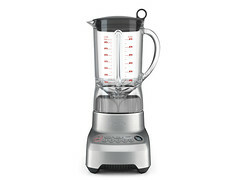 the Hemisphere® Control blender combines the functionality of a powerful blender with some food processing tasks for versatility and convenience. It also features a large 48oz BPA-free Eastman Tritan™ copolyester jug fitted with a permanent Hemisphere® Blade and Bowl System. A. Inner measuring lid for adding ingredients while blending. B. Large 48oz (1.5L) Eastman Tritan™ copolyester Jug with unique dual ribs. C. Die-cast metal base for long lasting, professional performance. D. Illuminated buttons for clarity and ease of reading. E. Electronic 5-speed control plus PULSE. 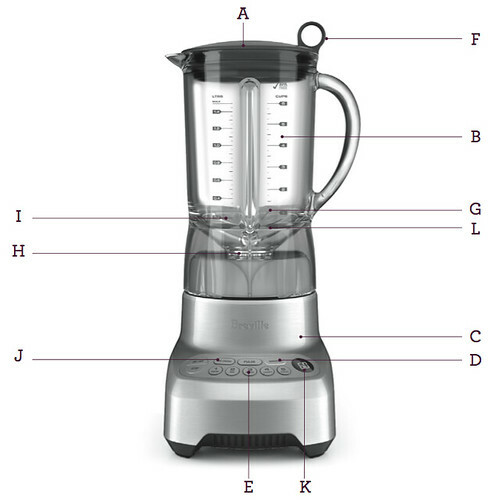 F. Breville Assist™ Lid. G. Stainless Steel ice-crushing blades. H. Hemisphere® Blade and Bowl system - revolutionary blade technology for 100% perfect blending and food processing results. I. Dishwasher Safe - the blender jug is ergonomically designed for ease of cleaning and is dishwasher safe. J. Pre-programmed 'Ice Crush' and 'Smoothie' settings. K. LCD display counts up on speed settings and down for pre-programmed settings. L. Surgical Grade Stainless Steel Blades to ensure the blades stay sharp longer.